Have you met my friend Ponga? He’s a sea turtle that plays the bamboo trumpet. Ponga is not your average sea turtle, of course. Most sea turtles do not play music, but they’re still very interesting! Sea turtles live in all the oceans of the world — that is, except the Arctic (it’s a bit too cold at the North Pole, even for turtles). There are many different kinds of sea turtles that fall into seven general species. Some sea turtles are large and some are small. By large, I mean very large! The leatherback sea turtle can grow up to 7 feet in length, weighing up to 1,30o pounds. No one really knows how many years these marvelous creatures can live, but it’s somewhere between 30 and 50 years. All sea turtles need air, but can hold their breath for a very long time. They have huge lungs to carry enough oxygen for long trips underwater. Filled with all that oxygen, they need strong legs to pull themselves down to the depths where they feed. I have some bad news. Each one of the seven species of sea turtles are listed as either endangered or worse, critically endangered on the IUCN Red List of Endangered Species. Isn’t that terrible? The biggest threat to turtles: Humans! These gentle creatures live in fragile ecosystems, like dunes and beaches. These spaces are challenged by poor fishing practices, new building developments, as well as increased forestry which results in soil erosion. Sea turtles are also very vulnerable to oil spills, because they spend so much of their time on the surface of the water. 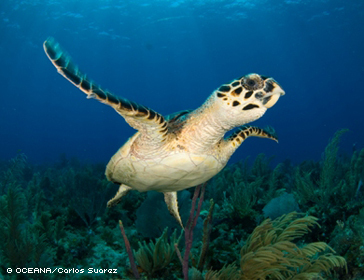 To learn more about the threats to sea turtles and what you can do about it, visit Oceana.